A great domain goes up for sale on GoDaddy. I have put the BoulderSEO.com domain up for auction: with the upcoming release of the top-secret WordPress real estate plugin, I have chosen to sell this prime property. 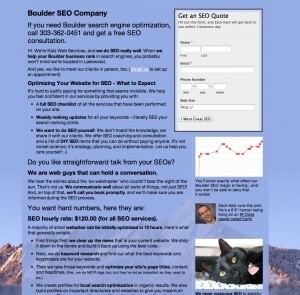 The BoulderSEO.com auction will be ending in 18 hours, so if you’re into Colorado, Denver, Loveland, or Boulder SEO (you get the idea! ), check out this auction. You will instantly rank well with this great domain. Currently priced at only $660 – it’s a great deal! With literally no work done on the site since April, 2009, I still get 1-2 leads/month from this site. This domain will pay for itself in a month. http://sn.im has editable URLs, a bookmarklet, but no stats. Oh, and they kept on deleting my links. http://bit.ly has great stats, name recognition, but the links aren’t editable and the stats are public. http://goo.gl is the fastest service (so they claim), they have good stats (maybe the best, since they include OS & browser information), but they don’t have editable links or private stats. Goodbye old friend. Hello shiny new domain! Recently I moved my company’s domain from KatzWebDesign.net to KatzWebServices.com to reflect the change of the business name (over one year ago) from Katz Web Design to Katz Web Services, Inc., to reflect the in company services offerings, and to have a .com domain. New Yahoo! domain prices — can they be serious? Is Yahoo! nuts? They want a 351% increase for domains! Important note: Beginning on July 1, 2008, Yahoo!’s annual domain renewal price increases to $34.95 per year. Yahoo is going to charge $34.95 a year for domains, up from $9.95. This is unbelievable. I know they’re trying to bolster their bottom line so Microsoft and Icahn stay away, but is charging 351% more than before, and 500% markup the way to do it? If you’re going to pay too much money for something, you might as well treat yourself to Starbucks and enjoy it. Massive Yahoo! domain name price rise – is it to pay for the lawyers? Yahoo needs all the good press it can get. This was stupid and an abuse of their stature. Author Zack KatzPosted on July 8, 2008 Categories DomainsTags Domain Names, Domain Registration, Domains, Greed, Markup, Money, Multiple Domains, Yahoo12 Comments on New Yahoo! domain prices — can they be serious?